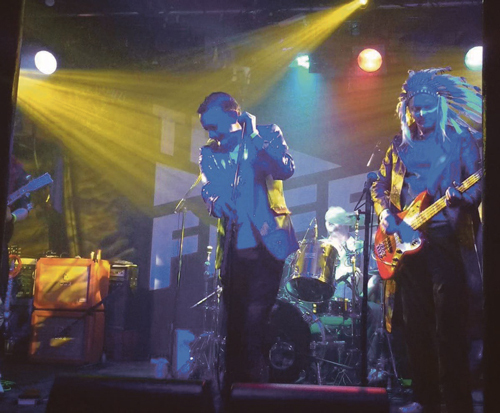 A charity music gig starring Bristol Glam Rock Band FAB 208 raised the roof in Bishopston in February and a magnificent £300 for The Grand Appeal - Bristol Children’s Hospital charity. The event was held on February 11 at Bristol St Andrews Bowling Club in Bishopston. Glen Wintle and Brian Mead helped to organise the evening and gave their thanks to John Hughes, his band members and Bristol St Andrews Bowling Club for hosting the event, which also led to a number of new people joining the club on the night. FAB 208, the West’s longest running 70s tribute band, were celebrating 25 years of playing gigs in the area with their own blend of Bowie, Slade and Alvin Stardust numbers. They played their first ever gig on 11 Feb 1992 at the Eclipse Bar in Stokes Croft. Brian Mead opened the event along with Spencer Wintle (club secretary) and Kate Jones (charity rep). Later in the evening the auction and raffle took place, plus a ‘celebrity appearance’ by Wallace and Gromit with lots of audience participation! The following organisations are thanked for their contributions: The Grand Appeal, FAB 208, Gloucestershire County Cricket Club, Somerset County Cricket Club, Weston Super Mare Grand Pier, Bristol Co-operative Party, Wookey Hole, The London Pass, Bristol Ferry Boat, Noah’s Ark Zoo Farm, Bristol Fryer and the Drapers Arms.